www.acumatica.com Blog ERP Implementation Life Cycle — What Is It? ERP implementation life cycle is the process of deploying enterprise resource planning software—from planning through go-live and beyond. The typical implementation cycle is six to 12 months. But don’t think it’s all about software. Make sure you’re prepared for these eight stages of ERP implementation. One question that always comes up very early in the process when considering an ERP implementation is “How long will it take?” While there is no general answer to that question – ERP implementations proceed at their own pace – the process can be outlined by way of a timeline or life cycle. Just for perspective, an ERP implementation can take anywhere from a few months to several years, with the majority ranging from six-to-12 months from kick-off (project planned and funded, team organized and ready to go, ERP technology and ERP system software delivered – if appropriate – and installed) to a live system in full operation. 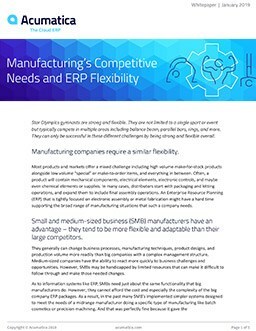 However long ERP implementations take, the result is the use of cloud-based ERP technology that makes end users’ jobs easier, efficient, and effective. And advanced understanding of the life cycle phases gives you a head start on experiencing a successful ERP implementation.